One thing I’m glad my Mom kept from my childhood was our “I Can Read” books. One of my favorites was Lucille. Garner picked this book out a long time ago and wanted it read night after night. She memorized the book and was able to “read” to me – almost perfectly. Tonight I overheard JD and Garner having bedtime story time. JD read Lucille to her and it reminded me of her reading it to me. Her little voice – so precious talking about Lucille and her friends. That’s a memory I never want to forget. I’m not sure it’s even in print anymore but if it is…it’s worth the read. 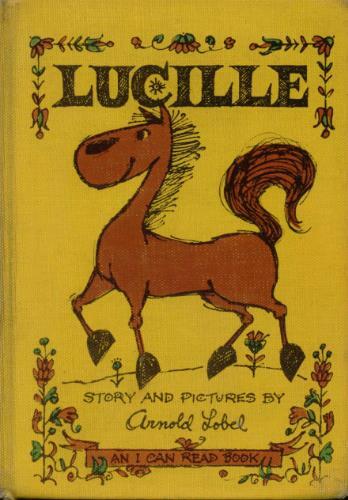 This book is about a horse named Lucille. Lucille belongs to a farmer, and helps him to plow his fields. One day Lucille realizes that she is `dull and dirty’. The farmer’s wife has also realized this. She takes it upon herself to turn Lucille into a lady. First Lucille gets a hat with pink roses on it. Next she gets four shiny, red, high-heeled shoes. And last but not least she gets a white dress. Now Lucille is all dressed up as a lady. The only problem is, she doesn’t know how to act like one. When the farmer’s wife invites some other ladies over to meet Lucille, she gets nervous. Finally she runs out of the farmhouse and back to plow the fields with the farmer. She has realized that you shouldn’t hide who you are. This story is told in a very straightforward manner that endeared it to me. Every page has wonderful illustrations. The pictures of Lucille all dressed up in her finery are really precious.